Cross-border ecommerce is popular in Europe. In 2014, a study has shown that more than a quarter of online shoppers in the EU have shopped online in another EU country. But there is still a long way to go: many shoppers are afraid to shop across the borders, because they are worried they don’t get the goods or need to put way too much effort in returning the products if they don’t like them. The European Commission is trying hard to make cross-border ecommerce easier for both consumers and sellers. Europe is not only a popular ecommerce destination for consumers and retailers in other European countries, Payvision’s report from 2014 showed that in North America, Europe was the first region of choice for cross-border expansion for two in three respondents. The European Commission asked retailers to provide them information about the number of visits to their websites that were made in 2014 from users located in each Member State. The average proportion of visits coming from other EU countries compared to domestic visits is approximately 20 percent. The figure above looks only at visits, but when we dive into the actual purchases, it shows that 55 percent of respondents reported that all their users were located in one country, while 12 percent sold to users located in 26 or more EU countries. On average, the proportion of cross-border purchases is 20 percent. A study in 2018 shows that for many online shoppers in Europe, China is a popular destination for their cross-border ecommerce purchases. In almost every country in Europe, China is the number one country from which online shoppers bought their most recent online cross-border purchase. In Iceland, Norway, Sweden, Finland, the UK, Denmark, France, Portugal, Spain, Italy, Greece, Latvia, Germany, Hungary and Slovenia this is the case. 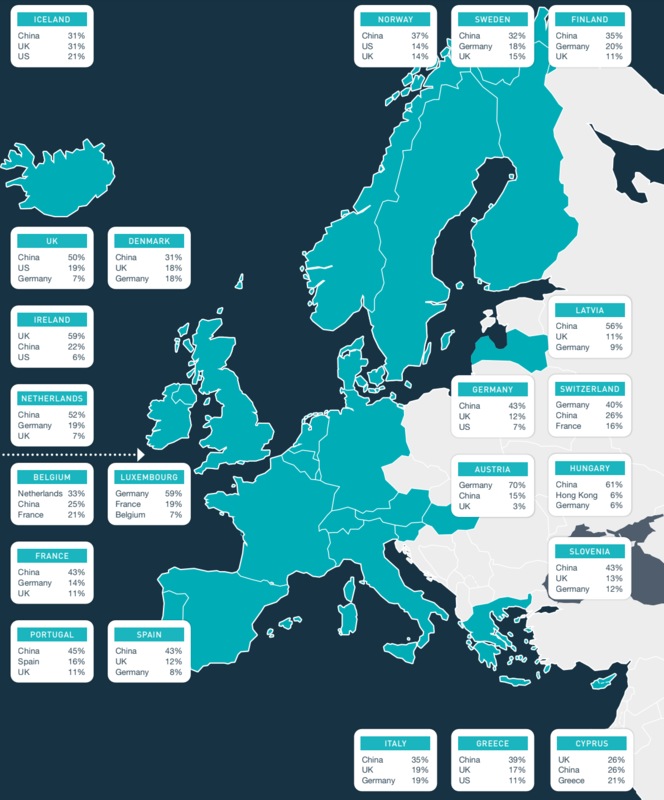 Cross-border ecommerce destinations for shoppers in Europe. In 2018, the organization Cross-Border Commerce Europe presented the first edition of its Top 500 Cross-Border Retail Europe study. This showed that 23% of ecommerce in Europe is cross-border. The study also showed that cross-border ecommerce in Europe (travel not included) accounted for 95 billion euros, with 55 percent of it generated by retailers located in the European Union. If you want to read more about cross-border ecommerce in Europe, you should check out our cross-border ecommerce category, which lists all the articles we’ve written about this topic.